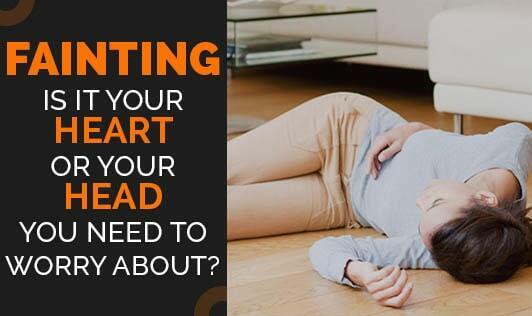 Fainting: Is it your heart or your head you need to worry about? It can sometimes signal other underlying issues as well and hence shouldn't be ignored. According to studies it is estimated that one amongst three people will faint at some point in their lives. Usually a person regains consciousness and gets back to his normal life quickly. But in some cases it might be due to a serious medical condition or a sign of a heart disease, so knowing the cause is important. A sudden drop in blood pressure resulting in lack of blood flow to the brain causes a person to faint. Numerous things affect the blood pressure. Sudden change in posture, certain medications, and dehydration may make the person feel dizzy, nauseated or can experience light headedness. This loss of consciousness leads to a loss in muscle control which causes the person to fall to the ground. Fainting can be due to crossed signal and over stimulation between the brain and the vagus nerve. This usually happens from standing for long periods of time, due to emotional distress, sudden trauma, or pain. Some people faint due to the sudden constriction of the carotid artery, hypoglycaemia, and certain types of medications including heart medications, diuretics, psychiatric drugs, narcotics, and antihistamines which may be a trigger. Although less common, heart-related causes for fainting are either too-slow or too-fast heartbeat. Less common causes may be a weakened or enlarged heart or damage to the heart muscle or aorta caused from a heart attack. Fainting can also be a sign of a valve disorder. A valve problem may decrease the supply of oxygenated blood to the brain usually in conditions like aortic stenosis which stiffens the aortic valve, but this usually occurs with age. A fainting episode should be taken very seriously. So make sure you consult your doctor to know the cause and treatment. It may not be just a faint!